THIS COURSE IS SOLD OUT – STAY TUNED FOR MORE ONLINE CLASSES COMING SOON! As we all begin to implement, activate and align the New Energy into our “Body 3D/Mind 4D/Spirit 5D”, I feel it’s extremely important that YOU personally understand at a deeper level what truly is happening within YOU at an energetic level! Knowledge is a powerful key that lies within. Most do not realize this, thus why they never turn the key to unlock the fountain of knowledge that is waiting to be tapped into! This is simply because most go outwards to find answers instead of going inwards! During this 6 week interactive online course, I will be sharing channeled information about the rewiring process that is now in play. As well, I will channel live new information when we’re gathered together each Tuesday evening. The channel already knows who will be attending so the information channeled will be exactly what we all need…including myself! Remember I do not get a free pass to bypass this process…that would be spiritual bypassing. I too am going through this process so I too will have to listen to the recordings myself when I’m not in channel mode. Those that have worked with me before know that this channel will provide basic information about the future, however until we enter into that energy, can I truly begin to talk about it, for it is all new to all of us! If we have not experienced this before then how can we truly understand it until we’re in it…we can not!!! We learn through experience and this is an experience we’re never experienced! It’s like the blind leading the blind into the land of unknown….we must feel our way, and align our “Body/Mind/Spirit” to allow our soul to shine brightly, all whilst the power up above to guides the way. 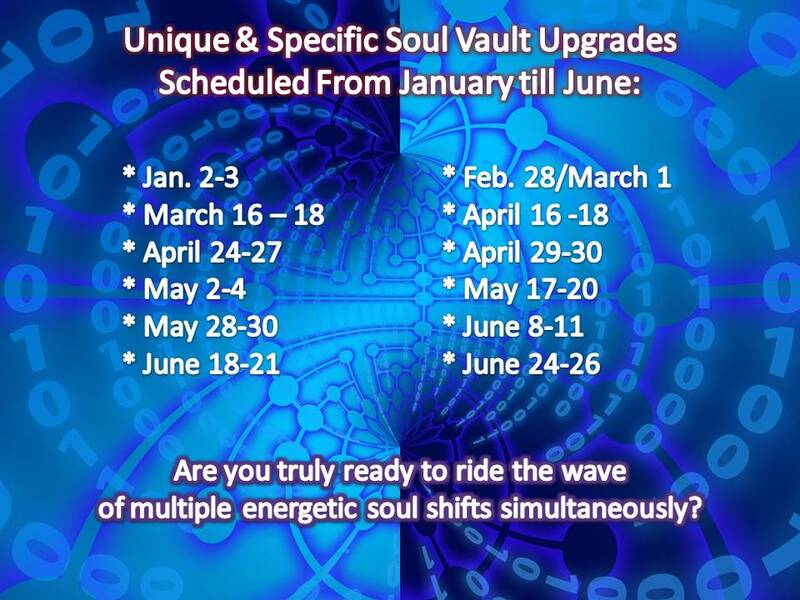 From January till June of this year, all of humanity will be going through 12 unique and specific Soul Vault (SV) upgrades, as well as, 10 Extreme Energy Clusters (EEC). This is why I have been guided to start this course on April 16th – it’s for a very good reason. We will be entering into an extremely powerful SV upgrade that day, a day when we will also be riding the energetic wave of 4 EEC’s. Each SV upgrade and EEC comes with a specific and unique energy, as well as, an incubation, implementing and activating period. On April 16th we’ll have one energetic wave activating, two in incubation, and two in implementing. What does this all mean? That on an energetic level you will be going through a great “Soul Wash” allowing the old to be cleaned up and healed all while you are shifting the healing energy so you can shift into higher frequencies. My channel recently introduced “Phase Two” of the shifting process. For almost two years we’ve been in “Phase One” – “Healing & Dealing”. Now they’re introducing us to “Phase Two” ~ “Healing & Shifting”. Please note that “Phase One” will always be in play. It is the foundation that is required in New Earth – which is 4D! We will cover why it’s so important to understand the difference between 3D/4D/5D. We do not want to live in 5D, for it you did you would be Spirit! You want to channel 5D! We will also get deep into how we ALL have a “Soul Vault” and how it works. Please note, some of you may share a “Soul Vault” with another soul who is of the same soul frequency. Many have put a label on this and believe they share a soul with someone else, which is simply NOT the case. If you are programmed in that matter you’re missing out on the true magic of sharing a “Soul Vault”…where so much wisdom, knowledge is waiting for you to tap into! For this course it does not matter if you share a “Soul Vault” or not, this is about YOUR soul and the energy that intertwines through you and around you. We’ve entered into a time where the “21 Day Process” is now in play. Something that I will cover for it is part of “Phase 2” and extremely important to understand, especially because we’re now becoming more multidimensional! This course will come into play as the SV upgrades and EEC begin to multiply on an energetic level. Each week we will shift in the number of levels we will be dealing with. We start with 5 levels then 6 levels for 3 weeks, then 4 levels, and finally last week at 3 levels. During week 2 and 3, in between classes, we will shift into 7 levels then back to 6. This may not mean much to you, however please trust me when I say that this is a very, very BIG DEAL! That is why; those who participate in this “Heal & Shift” online course will be required to check in with me directly, once a week– approximately 15 minutes – Sunday night through Tuesday afternoon. This is simply to see where you are within the process, get any questions you may want me to address in class and most of all to align with your energy. As the channel, it is important that I ensure I am as aligned as possible with all of you so I can intertwine all our energy together, and create magic energetically that will filter through the channel! Because of the energy work involved for this course, I will be limiting the number. When Spirit says stop I will. Please know that there will be no more than 20 participates – could be less, really depends who wants to participate and the energy level they currently are at. Having 20 extremely high vibrational participate will blow the system up and cause many not to be able to sleep….so we will not be going there! Numbers do not mean anything to me nor do I assume or expect, meaning whoever is suppose to be part of “Heal & Shift” course, will be. That’s how this lady works…it’s all about the quality not quantity. Please note you MUST have some basic knowledge of energy, specifically vibrations and frequencies to participate. Each week will begin at 8:30 pm EST and will be approximately 2 – 2.5 hrs. If you’re not able to attend class, you will receive a copy to ensure you’re up-to-date on the channeled information and have that weeks “Soul Work”. YES, you will have to do “Soul Work” each week, for I can introduce you to this new way of being, however you must implement, activate and align the energy yourself! To register, please send me an email by filling out the form on the right hand side of this page. There is a payment plan available, please ask if need be. Canadians can either pay via email transfer or Paypal. All others must pay via Paypal. A Paypal invoice will be sent once we connect directly. Please allow up to 24 hours to receive a response. I am honored and very much looking forward to going through this life altering process with many of you!